I am one of the South Coast’s leading Balloon Modellers. As such I create all sorts of different sized balloon models ranging from small one balloon creations right the way up to large multi-balloon ones. I make things like a ‘Flying Mouse’ where the children and adults can actually fly the mouse by pulling his tail! A large ‘Octopus’, or even a cute ‘Monkey on a Tree’! So there is sure to be a creation I make that will be a winner with both the children and adults attending your next event. The range and type of models I can make at the event depends on a couple of different factors: How long the event is going to last and numbers of guests attending the event. When I arrive I’ll set-up a small stand with my Balloon Bag-Box on and a pump next to it and I am ready to go. The amount of space required is very small for the actual making of the balloons, but you will want to have some space for a que! My balloons are very popular and seem to always attract a que whilst making them, so although I can make them walking around your event, the line will follow. 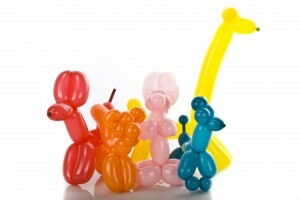 It is therefore suggested that you set aside an area for the balloon modelling at your event. That way everyone will know where to come to get their balloons. As a rough guide for most events I tend to stay for about 45 minutes to an hour. As in that time I can make a range of models for selection of the guest’s attending the event. However I don’t just attend small events with my balloons. I am regularly booked for weddings, christenings and other events just to provide balloons and stay for the entire event. This allows me time to create some really cool balloon creations including an ‘Alien with a Space Helmet’ and ‘Butterflies & Dragon Flies’! Hats are also another fun creation that I love making and my creations are seen walking all over your next event! For more information and prices please use the “enquiry” page above and simply fill in all your information and I will forward you back more information, or give me call to discuss your next event.